Growing up, raw carrots, lettuce, and tomatoes were welcomed on my plate, for the most part, and nothing else. The green vegetables were what I had a tough time with. Mushy, and usually marginally seasoned thus resulting in my conviction: I will never eat vegetables for the rest of my life. I hated asparagus and broccoli the most – the water clinchers. Oh yeah, and the frozen green beans vegetables – how can we forget? Now I realize it’s because they were mushy asparagus, broccoli, and green beans (sorry, Mom – love ya). And you know, when the green becomes a dark army green when overcooked? Sigh. With a little technique, gone are the days of less-than-crisp green vegetables. Hello very green, crisp and full of flavor (Mom’s are too :)) asparagus. And with a little black truffle salt … BLISS. 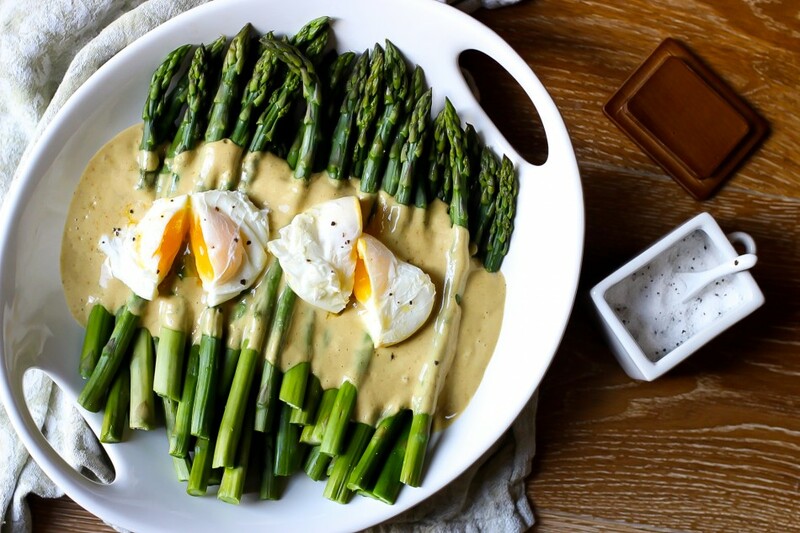 Asparagus is one of my favorites – simply steamed or roasted, it’s perfect, however for occasions like Easter or brunch where you want to fancy things up and not spend too much time fussing over the food – THIS. is. it. 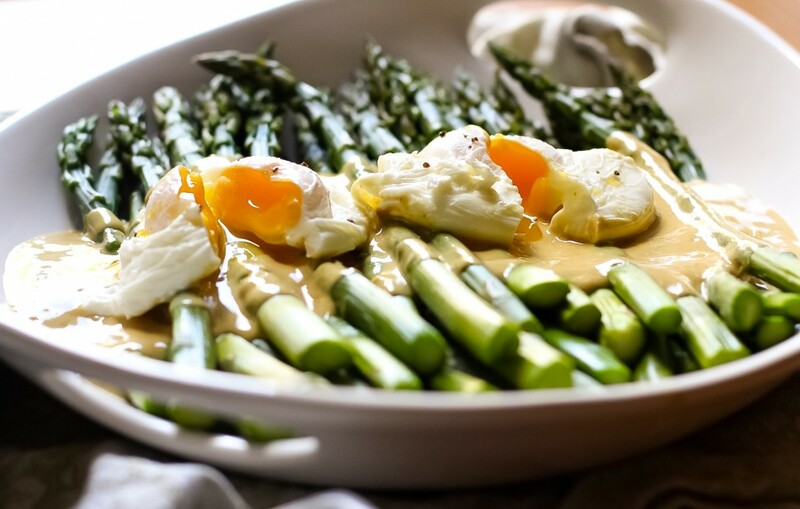 Perfectly steamed asparagus with a sharp mustard anchovy vinaigrette topped with poached eggs is one side dish everyone will love. I know, I know, I say “optional” on the black truffle finishing salt, and it is, though I can’t help encouraging the splurge because it makes everything taste better. For those who don’t know, my oldest son, Jonathan, cannot eat eggs so when he’s joining us (he’s 23) I serve without and crumble some crispy bacon over the vinaigrette instead. This recipe can easily be doubled with each component also made ahead. 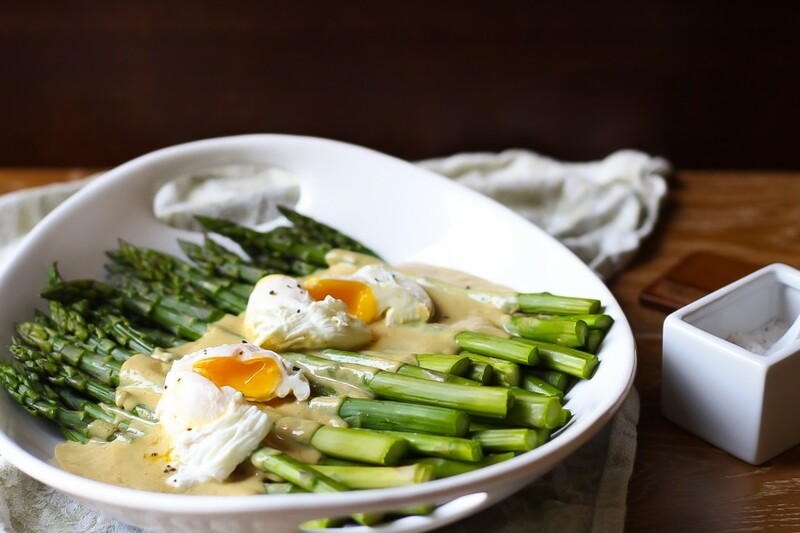 The sauce tastes like a cross between a caesar salad dressing and a hollandaise sauce – slightly tasting like anchovy, but more like tangy from the mustard with a nice citrus bite to it. It’s my lighter take on hollandaise, to justify any cake eating (ahem) in case there may be some in the freezer. Not to leave out some nutritional talk, this has all sorts of nutrition, with Asparagus, being high in Vitamin K, lycopene, and folate, and poached eggs high in protein, lysine (well needed and not just for cold sores), B2, B6, B12, Vitamin D, and selenium. Even the dressing has nutrients from the olive oil, anchovy (protein, iron, magnesium, omegas) and all that cold-fighting vitamin C in lemon. We can leave all this nutrition stuff between you and me and just serve it as a neat little brunch dish. Hehe. 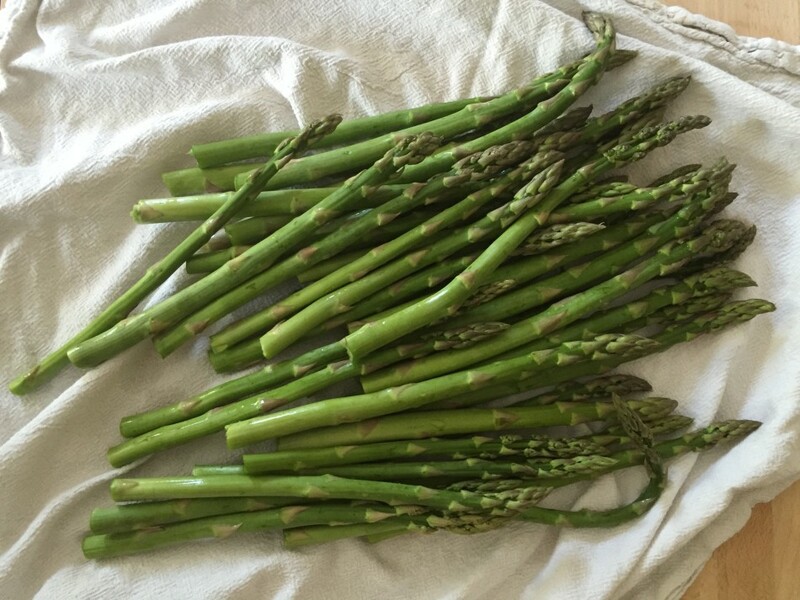 I’ve left a whole bunch of notes below on all sorts of little facts and tips on asparagus and poaching – hope they will be useful. I’ve put asterisks by each note to try to separate them … let me know if that’s helpful or more confusing. I make my poached eggs slightly firmer (kids don’t like them too runny), but you can easily adjust poaching time to make them super-oozy if you like. Quick, easy, AND delicious brunch/breakfast dish that is ready in under 20 minutes - perfect for easter brunch or anytime during the spring season. Easily can be doubled or make ahead. Fill the bottom portion a quarter of the way of a large steamer pot, or what you use for steaming. Set on high heat. In the meantime, prepare the mustard anchovy vinaigrette. Combine all the ingredients into a tall jar or some vessel that won’t splatter while mixing and emulsify the ingredients using a hand-held immersion blender until well blended. It should be thick yet pourable, like dressing. Check seasoning, it should taste like a tangy mustard lemon infused with anchovy flavor. Set aside. The vinaigrette will remain fresh refrigerated up to a week in a sealed container and can be frozen for up to a month in a freezer-safe container. When the steamer pot comes to a boil add asparagus for steaming. Steam for 4 minutes, exactly. 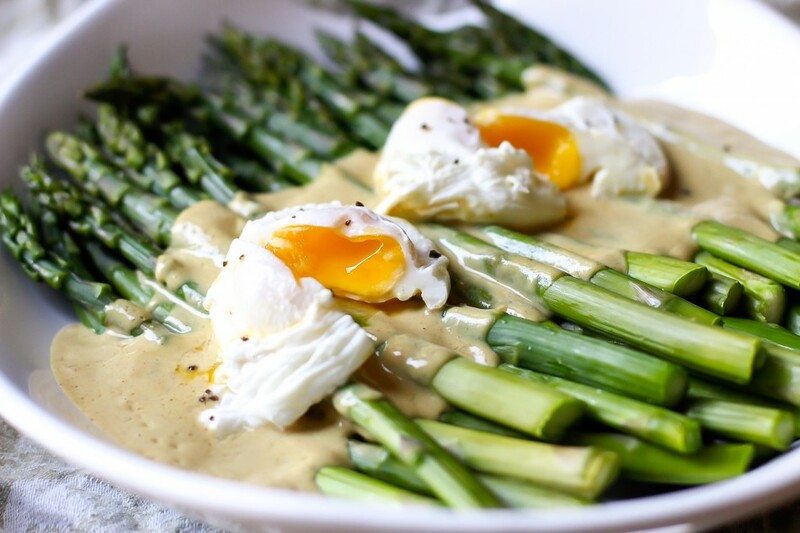 While the asparagus are steaming, crack one egg into a very small bowl and keep the other eggs and a spoon nearby. When the asparagus is done, transfer to a large sheet tray or cutting board and spread out in a single layer (see notes). Remove the upper basket, then add vinegar and kosher salt to the boiling water. *The vinegar will turn the green-tinged water white. Reduce heat to low. Bring the bowl down to the water surface level and gently add the egg. Repeat with remaining eggs. Set the timer and poach between 3-4 minutes to your preference (see notes) until the white are set but the yolks appear runny. *Yolks should look wobbly, not like round, firm circles. Stir the water occasionally and keep the whites contained, if need, by gently guiding the whites to the yolk. When ready, pick up each egg with a perforated spoon and to a plate. 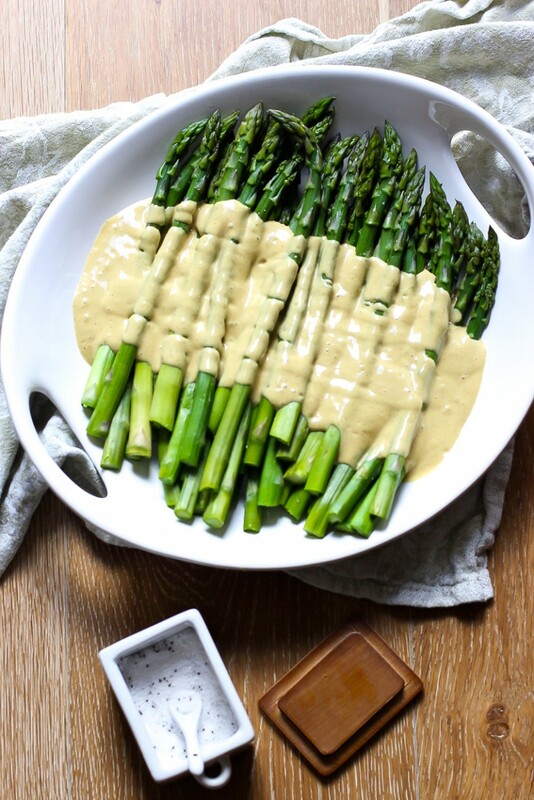 Prepare asparagus on a serving platter then drizzle vinaigrette. Set poached eggs on top and slice through the middle. To finish: sprinkle on black truffle finishing salt, or your sea salt of choice. *If you absolutely hate anchovy in your vinaigrette, you can easily swap it for out for cooked bacon, diced fine, or leave out either. Vegans: Sub anchovy for coconut amino's, it adds a bit of a briny flavor. Sub the eggs for potato hash (think: yukon golds, reds, or hannah sweet potato), as the flavors in the vinaigrette go well with it. *Use green spears (strongest grassy-like in flavor than other varieties), white (actually cultivated differently by growing covered in dirt to prevent chlorophyll development, slightly sweeter in taste), or one of the purple varieties (different breeding practices and milder tasting than green varieties). *Make sure they are firm, crisp stalks with fully closed budding tips. Older stalks begin to open up and dry out and the ends appear moist but not wet nor dry or woody. If it’s available - local, organic produce will always taste better than asparagus from Central America in April. *Thin stalks can be more intense in flavor than thicker varieties and less watery. *Thicker stalks are more tender, and milder, but can get watery since they hold more water (and also contain more fiber) hence the need to time the steaming. *Either type work well for steaming. I personally like thicker stalks for stir fry, grilling, and sautéing since the thinner stalks can dry out quickly with high heat cooking. *We have all heard about how the snapping of the stalks will snap at just the length but have also snapped the same bunch resulting in different lengths. Over time, I realized that’s not true. *Instead, cut off the ends at the point the color fades, or for the white variety where it feels harder than the upper parts of the stalk. You can feel how hard the faded section is compared to the rest, this is where you should cut off the ends. *Freeze the trimmed ends to add to onion, and carrots, or any of your favorite stock vegetables, for a homemade vegetable stock. *I used to peel the stalks. They do make the asparagus buttery soft, and if you have the time go for it. I generally don’t but find (as in those I have served unpeeled asparagus to) with proper steaming they are as delicious texturally. *Asparagus doesn’t do very well sitting in the refrigerator for too long — it loses it’s flavor, which is why sometimes it has more flavor yet other times bland without a good dose of salt. *To keep them fresh, trim ends, set in a glass jar (like flowers), lightly covering the tops, and refrigerate for up to 2 days. *I find steaming asparagus keeps if firm yet soft enough for the perfect bite, whereas blanching can make them soggy, and a dull army green color. *Keeping that bright green color requires blanching in a big pot of water (2 gallons per bunch) with copious amounts of salt, in addition to ensuring the water is at a constant rolling boil so as not to destroy the chlorophyll enzyme chlorophyllase, which keeps it bright green. As if that wasn’t enough, we then need to make sure acids such as lemon or vinegar aren’t added during the boiling process, which can affect the temperature and make those emerald green veggies brown. And then ‘shocking’ them in an iced water bowl. It’s a lot of water, salt and preparation for the same effect in my opinion. And if I haven’t convinced you to go the steaming route, keep in mind that blanching also pulls out all the nutrients into the water. *A 4-minute steam will soften the asparagus yet still be crisp; any more than that it will be too soft and mushy. *You can go the extra mile by transferring them to a bowl of iced water to ‘shock’ them as this will prevent the vegetable from continuing to cook. But you don’t need to if you spread the asparagus (or any steamed vegetable) out in a single layer to prevent heat trapped between layers. *The fresher the eggs, the more contained the poach egg will be. *The older the eggs, the weaker the membrane that surrounds the white becomes, and what is likely to result in egg whites spreading once you submerge into water. 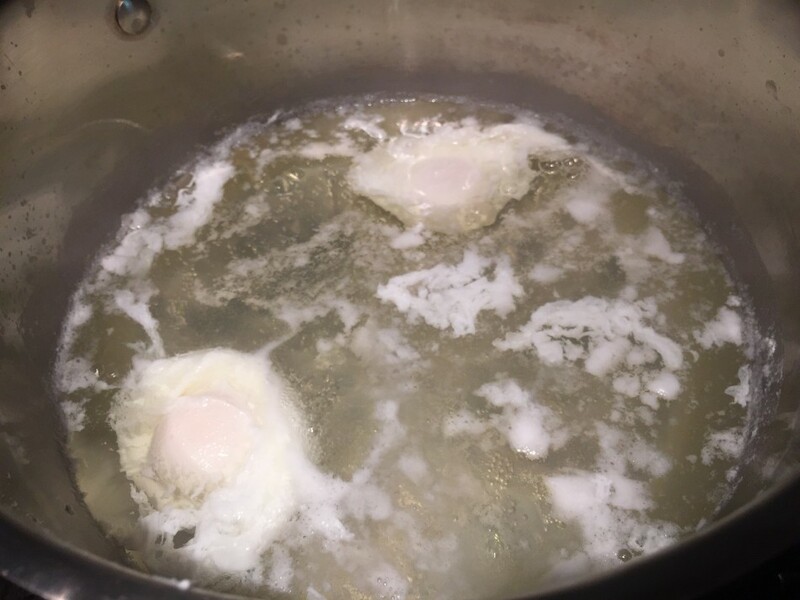 *Speaking of submerging in water, less bubbling of water (why we reduce to low after initial boil) will keep the eggs from separating. *A little vinegar will help set the proteins but too much will make the eggs taste vinegary and possibly tough. *Salting the water is not for the technique, rather for the flavor. A sprinkle of finishing salt on top will take your poached eggs to new heights. If you have some, don’t hesitate to use it. *Three minutes will result in oozing out of yolk and very soft white. *Three minutes 30 seconds will result in a little spill and soft white. *Four minutes will result in a slight spill - outer surface of the yolk firmer yet yolk still runny with white being well cooked and solid. I poach between 3:30 and 4 minutes to preference, as pictured in the recipe. 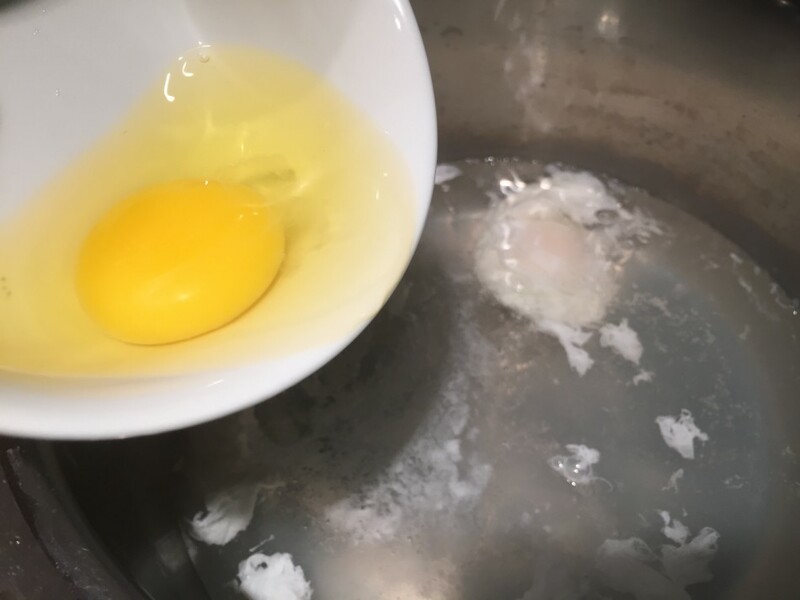 *Some use a fine mesh strainer for poaching by cracking an egg into a bowl then transfer into a fine mesh strainer to allow loose egg white to drip through and then carefully submerge the strainer into the water and tilt sideways to slide into the pot. This works if you do so immediately. If you let the egg sit in the strainer (above the bowl for no mess!) for a minute or two it clings to the strainer and pulls on the yolk. If you do have pieces of white dangling on your poached eggs, gently separate with a knife when done cooking. 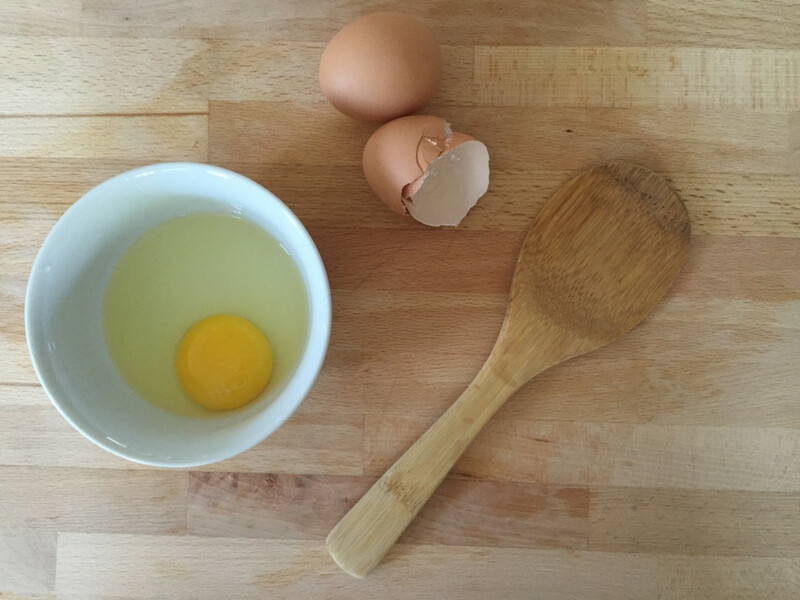 *To make ahead: poach 30 seconds less than desired time, 3-4 eggs at a time (to maintain even cooking times) then remove each egg with a perforated spoon and transfer to a bowl of cold water to chill. Then store submerged in water for up to 3 days. To reheat, transfer to a bowl of very hot water (quantity can reduce water temperature, do make sure the water is very hot to the touch) and allow it to come to warm temperature, about 15 minutes. *Poached eggs are never very hot, the yolks would solidify if they were so they do well made ahead and is how it is usually done by caterers and short order cooks. Looks delicious Jessica! I want to print out the recipe but it has weird coding words in the recipe title when I'm ready to print. Help! Remember the soggy vegetables well. So much good information, makes sense now why my vegetables come out inconsistent. Never tried poaching but with your tips I think I can do this. Nice photos! This dish can brighten any table. What a lovely side dish that can complement any meal. Also, thanks for the tips to prepare the perfect green vegetable. Looking forward to your next post. Love the colors and everything about this recipe including the notes! I can't wait to try the recipe especially the vinagrette...love anchovies. Yummy! That platter looks gorgeous! Thank you for clarifying poaching results. When I see photos of poached eggs I'm not sure how long it took because the time is given to be within a couple of minutes. I see that even a minute makes a difference! Funny I was just talking about poached eggs and I was actually going to look up some advice online and here I see this today! Beautiful as well, holy moly!! I was going to ask for a vegan substitute for anchovies but see you've provided an option, which is great. I was thinking of trying this without eggs, with just chopping the asparugus up and mixing with a little dressing for a salad, in a way.. Would you recommend? My first poach and it turned out great! Thanks for my new favorite dreesing. I was a little hestant about the anchovies but figured it would be good after making some of your other recipes and sure enough it was delicious. So happy to hear that - thank you for sharing Traci! Thank you for all the helpful tips. Poached my eggs perfectly and this is the best sauce ever!! Made this for dinner tonight and just had to say how flavorful it was. The vinaigrette sauced up with the egg and asparagus was delicious. I don't like my eggs overly runny, the 4-minute time you recomended was perfect! Saw this on Elledecor.com and had to try it. I made it this morning for breakfast and it was amazing. The mustard vinaigrette is everything. What a way to spice it up some vegetables and poached eggs. Awesome recipe! Terrific recipe! 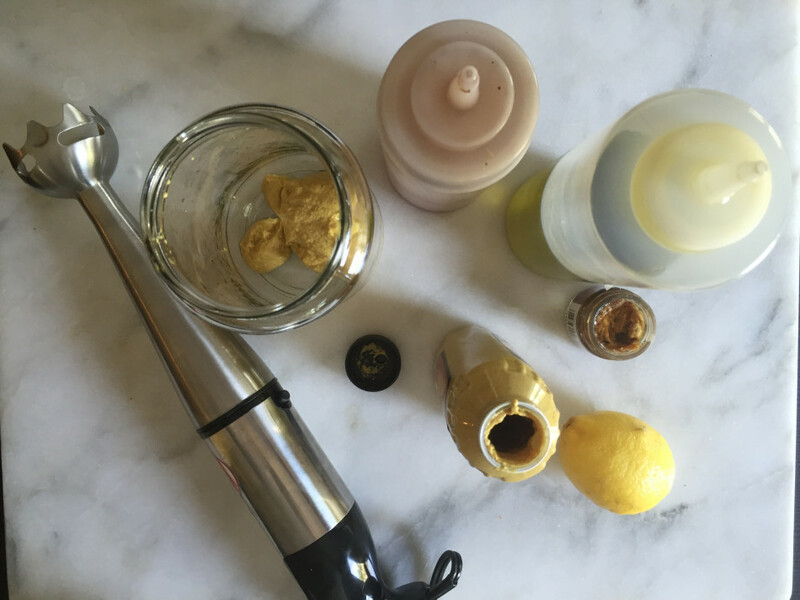 The anchovy mustard is amazing and think I'm going to use it as a sauce for everything! I know, that sauce is just goodness. Happy to hear you loved it Bethanny, enjoy! 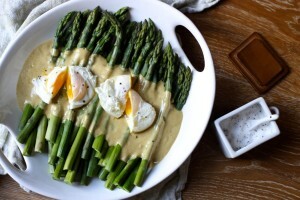 Great recipe I've now figured out how to poach eggs for this amazing sauce!